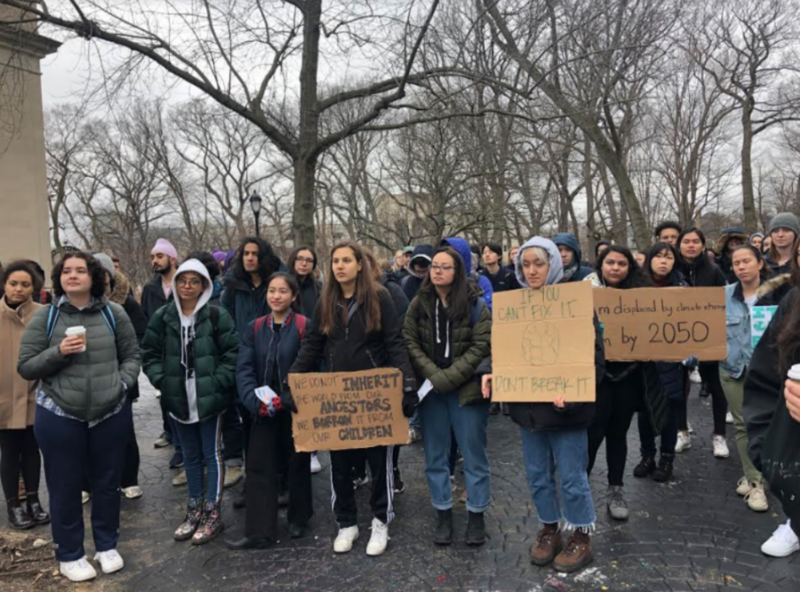 Nearly one hundred Northwestern students and Evanston residents gathered at The Rock Friday for a climate strike as part of a global movement of protests against climate change. Though the strike was part of a larger movement, Northwestern students drafted their own demands, some of which were targeted at Northwestern policy, said SESP sophomore Melissa Batz, one of the event’s organizers. Batz and the other organizers of the strike wanted to focus on “environmental justice,” she said, which involves policies that benefit marginalized communities. The environment hasn’t been a major issue in politics partly because climate change disproportionately affects minority communities, Batz said. Landfills are more often located near predominantly black and Latinx neighborhoods, she said. SESP first-year Medinat Ayodele, who attended the climate strike, said she believes environmental and racial issues are interconnected. Many Northwestern students don’t care that much about the environment, she added, which creates a disparity between values students say they hold and issues for which they actually advocate. However, Ayodele said, people are much more mindful on campus of small things like recycling than they are in her home state of Iowa. She added that she hopes progress she’s seen won’t be derailed by what she considers the University’s lack of commitment to sustainability — sustainNU, a University program that aims to reduce NU’s contribution to climate change, only lists two non-student staff members on their website. “It makes me question why the environment is something that Northwestern is not prioritizing,” Ayodele said. Although NU won the 2018 Illinois Sustainability Award, has acquired 16 electric vehicles, cut waste to landfills by 38 percent and received its first LEED Platinum building certification, students are skeptical of its commitment to environmentalism. In response to the $94 million budget deficit, the University cut the Northwestern Sustainability Fund for the 2018-2019 academic year, which previously set aside a pool of $50,000 for students to pursue sustainability projects. Associated Student Government legislation introduced last month would create the Student Group Sustainability Fund as a replacement to allow student groups to pursue more environmentally sustainable practices, but the money would only be accessible to ASG-recognized student organizations. Weinberg sophomore Juan Zuniga, the ASG vice president of sustainability, gave a speech at the strike asking that students take more initiative to be environmentally conscious if the University wasn’t going to support sustainability efforts.